With the Fourth of July just around the corner, summer fireworks season is about to explode into colorful spectacles in the evening sky. While the booms and flashes are fun for people, they’re not always as great an experience for your four-legged friend. Here are a few tips to help your pup through what can be a difficult time. First and foremost, the best thing to do with your dog is to keep him or her far away from the spectacle. If staying in isn’t an option for you, try to take in the show from a distance to minimize the shuddering booms and explosions of the firework blasts. These loud noises can terrify dogs, making them want to run and hide which can lead to an accidentally hurt or lost pup. Another great option – for any day, really – is to make sure your dog gets plenty of exercise during the day. If your dog has had an exciting and energetic day, they will be more tired in the evening. A sleeping and subdued dog is a peaceful dog when it comes to the Fourth. You can also often put a dog at ease with soothing background noise. An interior room of your home often works best, where you can put on some music or a television show. Combined with your presence, and perhaps the additional lull of a fan, your dog may not even perk up at the pops of fireworks. In just the same way as the white noise provides a distracting atmosphere for your pup, a favorite toy or delicious treat can also divert your dog’s attention. If he or she is focused on playing or gnawing on a treat, they may not pay attention to the flashes and booms outside. You can also try to put your dog at ease if they are scared by noises with small treats, providing some positive reinforcement, says PetsLady.com. A final option to help keep your canine calm is through using one of the many products available that are designed to keep dogs relaxed during stressful situations. These vary from pheromone sprays and collars to melatonin supplements. You may wish to try these options ahead of the holiday to see how effective they may be for your furry friend, but many pet owners have found success with these products. 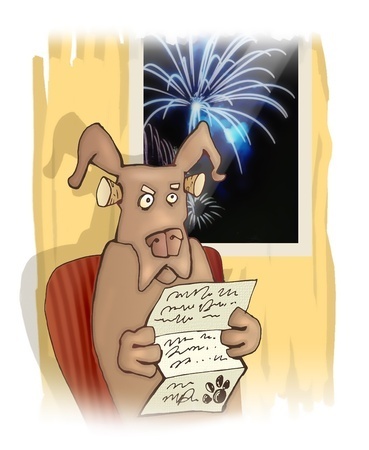 Don’t forget to make sure that your dog’s collar and contact information are in place before the evening starts, as well, as many dogs can panic and bolt during fireworks, leading to lost and stray family members. Keeping that information easily found and updated will help whoever finds your pet reunite him or her with you swiftly. Stay calm and cool and be conscious of your dog’s needs this holiday, and everyone in your family can celebrate the day safely.